January 23, 1999. A day trip from Paris, France. 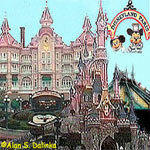 On January 23, 1999, after nearly a week of visiting Paris, France, I took the 45 minute RER commuter train about 20 miles to the east of Paris to the Marne-la-Vallée-Chessy Rail Station for my first visit to the Disneyland Paris Resort. As of this trip, the Resort included one theme park: Disneyland Paris (1992); seven hotels and the Disney Village entertainment district. The Rail Station is located between the Theme Park and the Disney Village. At the end of my visit that evening, I took the RER train back to my hotel in central Paris.